on October 1, 2018, 1:31 p.m.
With increased awareness of the health issues there is constant pressure to make healthier choices in your day to day meal consumption but does the constant advertising of unhealthy options put unwanted pressure on the consumer to break this? Close to half of GCC respondents (45%) mention being exposed to fast food advertisements every day, which makes it harder and harder for the consumer to not sway towards these less healthy options. This number is highest in Kuwait (67%), a country that currently charts at highest incidence of obesity in the Middle East. 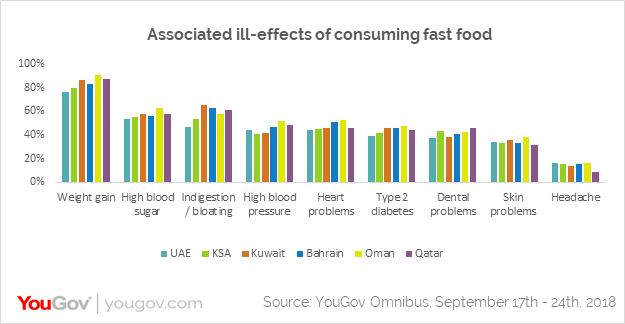 Previously, less than a fifth of GCC respondents consumed fast food at least once a week. However, when looking at the impact on this number post exposure to advertising, 2 out of 5 people claim they are doing so after watching an ad on TV. Half of the GCC respondents indicated they are concerned about fast food advertising on television but there are vast differences between neighbouring countries. In the UAE, more than 60% of the respondents are concerned while in Kuwait & Oman over 60% are indifferent/not concerned at all. Around three quarters of respondents indicated being concerned about children’s exposure to fast food TV advertising, with close to a quarter (23%) indicating their child asks for fast food after watching these ads. A whopping majority (87%) said that TV advertising impacts children's current food choices, and also believe that if children are exposed to fast food ads at a young age, it will affect their food choices in the future. The GCC respondents stay divided on their opinions on the effectiveness of the current control on TV food and drink advertising. In the UAE most people (63%) feel these measures are effective, whereas in KSA, Oman and Qatar, a lower rate of 44% of respondents indicated the controls are effective. This dropped even further when looking at countries such as Kuwait and Bahrain, where only a third believed the measures to be effective. On a side note, when looking at strategies fast food companies adopt to entice children, 7 in 10 respondents voiced their concern against toys being used to promote food and drinks. Although most people in the region are aware of the ill effects from eating fast food, the consumption remains high, especially after watching these ads. Around half of the respondents pointed out bloating, indigestion and high blood sugar as some of the adverse effects of eating a lot of junk food. Over 40% of respondents associated it with more serious issues like high blood pressure (44%), type 2 diabetes (42%) and heart problems (45%). Two thirds of people said buying fast food is an impulsive decision. This is a typical behaviour in Kuwait, Saudi Arabia and Qatar, where over 7 in 10 people stated this. Interestingly, these are also the top three countries in the Middle East where obesity is the highest. Data collected online by YouGov Omnibus among 2,743 respondents in GCC countries between 17th and 24th September, 2018 using YouGov’s panel of over 6 million people worldwide. Data is representative of the adult online population in these countries.